Anne Perry’s magnificent Victorian mysteries established her as one of the world’s best known and loved historical novelists. Now, in her vividly imagined World War I novels, Perry’s talents “have taken a quantum leap” (The Star-Ledger), and so has the number of her devoted readers. 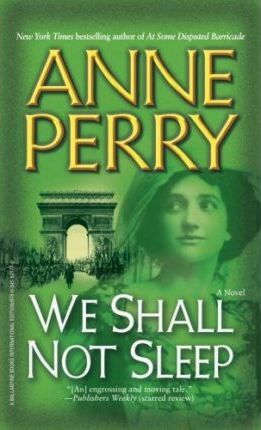 We Shall Not Sleep, the final book in this epic series featuring the dedicated Reavley family, is perhaps the most memorably enthralling of all Perry’s novels. After four long years, peace is finally in sight. But chaplain Joseph Reavley and his sister Judith, an ambulance driver on the Western Front, are more hard pressed than ever. Behind the lines, violence is increasing: soldiers are abusing German prisoners, a nurse has been raped and murdered, and the sinister ideologue called the Peacemaker now threatens to undermine the peace just as he did the war. Then Matthew, the third Reavley sibling and an intelligence expert, suddenly arrives at the front with startling news. The Peacemaker’s German counterpart has offered to go to England and expose his co-conspirator as a traitor. But with war still raging and prejudices inflamed, such a journey would be fraught with hazards, especially since the Peacemaker has secret informers everywhere, even on the battlefield. For richness of plot, character, and feeling, We Shall Not Sleep is unmatched. Anne Perry’s brilliantly orchestrated finale is a heartstopping tour de force, mesmerizing and totally satisfying. Anne Perry is the bestselling author of the World War I novels No Graves As Yet, Shoulder the Sky, Angels in the Gloom, and At Some Disputed Barricade; as well as four holiday novels: A Christmas Journey, A Christmas Visitor, A Christmas Guest, and A Christmas Secret. She is also the creator of two acclaimed series set in Victorian England. Her William Monk novels include Dark Assassin, The Shifting Tide, and Death of a Stranger. The popular novels featuring Thomas and Charlotte Pitt include Long Spoon Lane, Seven Dials, and Southampton Row. Her short story “Heroes” won an Edgar Award. Anne Perry lives in Scotland. Visit her website at www.anneperry.net.